Free magic card tricks! This is a classic trick on a miniature scale, you've seen the zig zag lady routine before right - but what about the zig zag playing card? See my other page HERE for an alternative version. FREE MAGIC CARD TRICKS, COMING RIGHT UP! THE EFFECT: The magician shows an ordinary playing card to the spectators and a card case. The playing card is placed into the case and the front of the card is shown in full view. Suddenly the magician begins to remove the center of the playing card! 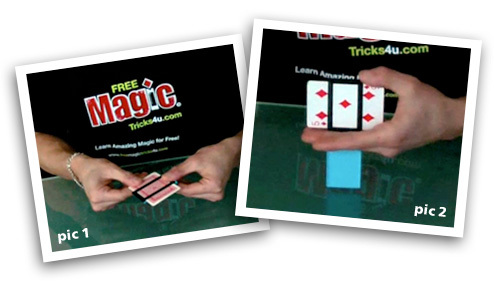 THE SECRET: Learn free magic card tricks! The secret to this effect is the actual card case you use to do the trick. It contains a sneaky mirror, which when held reflects your fingers giving the illusion you can see right through the card. Yep this time it really is all done with mirrors! To build your own gimmicked card case you can download my instructions and templates HERE. Feel free to decorate it in any way you want. Use a piece of thin mirror tile for the case or if you are on a budget you can make do with using some tin foil (aluminum foil). Once you have made your gimmick you are ready to perform! Begin by showing the playing card to your audience and the card case front and back. With the cutout side of the card case facing up slide the playing card into it face down, so it is in the dead center (pic1). Open up the case and show the front of the card (in fact your spectators will be seeing the duplicate middle of the other card). Hold the card and case, with the flap hanging down in between your pointer and ring finger. Steady the card if you need to with your thumb (pic2). Give a magical gesture and begin to pull the center of the card out from the case. Do this slowly to give the effect time to sink in with your spectators. Be sure not to pull the card too far out or it will be obvious you are using a mirror. After a few seconds push the center back into the middle of the card and close the case. Remove the card and show it has been restored. The card can then be handed out for examination, but obviously not the gimmicked card case! I have also included instructions to make an ordinary non gimmicked card case which you can use to switch if you want. That way your spectators can examine everything. Just place the card case into your pocket after the effect, then say something like. "Oh sorry did you want to have a go" Reach back into your pocket and bring out the duplicate non gimmicked card case and hand it to them. TIP: Try and keep the mirror nice and clean, free from any dirt or fingerprints. The whole effect relies on a nice clean mirror which goes unnoticed. If the mirror is dirty it will show and ruin the illusion. An alternative Zig Zag card effect can be found HERE.